Arthur Curry must go to Atlantis to challenge his half-brother King Orm for the throne to prevent a war between the surface world and the underwater kingdoms. The DC Extended Universe spent its first few movies trying to be a super dark, uber self-serious superhero franchise. "Aquaman," however, takes a totally (and tonally) different approach, going full-fledged goofball in a complete 180 turn in the opposite direction. This sixth entry into the DC cinematic franchise is directed by James Wan, who is mostly known for helming horror films like "Saw," "Dead Silence," "Insidious," and "The Conjuring." 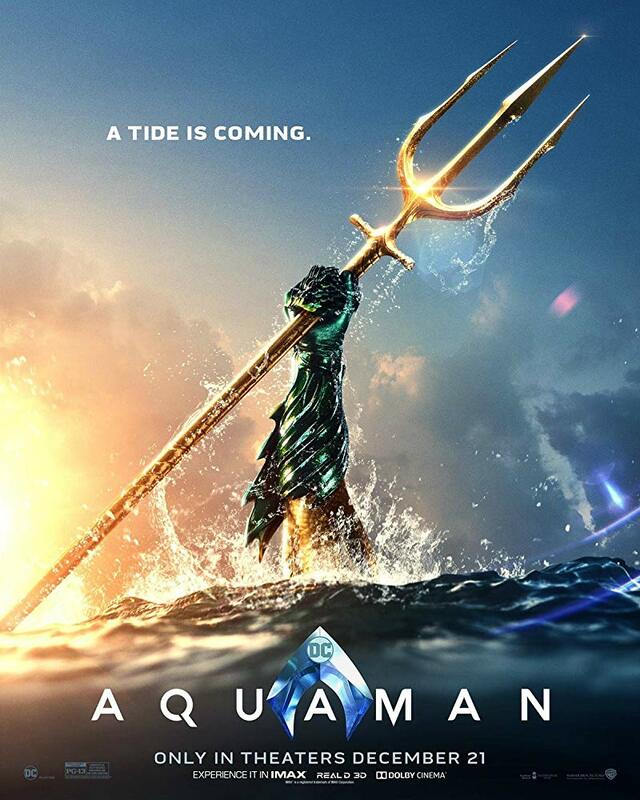 After a brief flashback to the story of Aquaman's half-human, half-Atlantian parentage that tells of how his queen mother Atlanna (Nicole Kidman) met his lighthouse keeper father Tom (Temuera Morrison), the rest of the film picks up after the events of "Justice League." 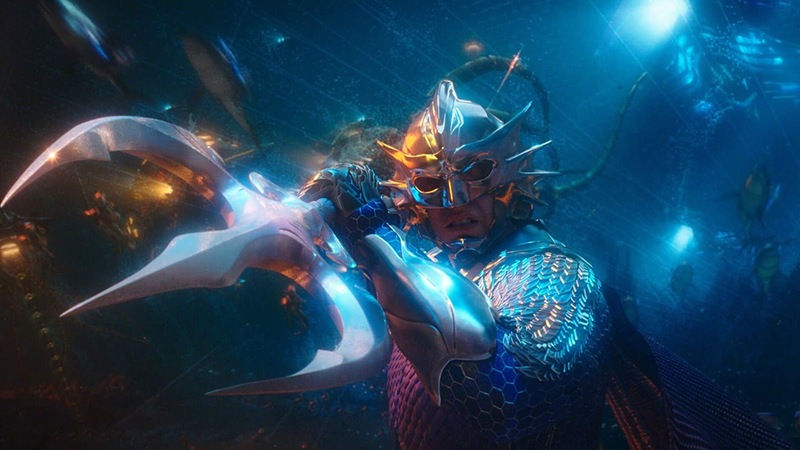 King Orm (Patrick Wilson) of Atlantis, Aquaman's (Jason Momoa) half-brother, is plotting to start a war between the underwater nations and the surface world. Princess Mera (Amber Heard) goes in search of Arthur to convince him to seek out the Atlan trident and use it to challenge Orm for the throne of Atlantis so he can create peace between the two worlds. 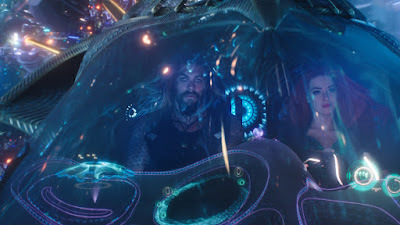 Now, Aquaman must face off against Orm and his army who literally ride sharks with frickin' laser beams attached to their heads. Dr. Evil would be so proud. 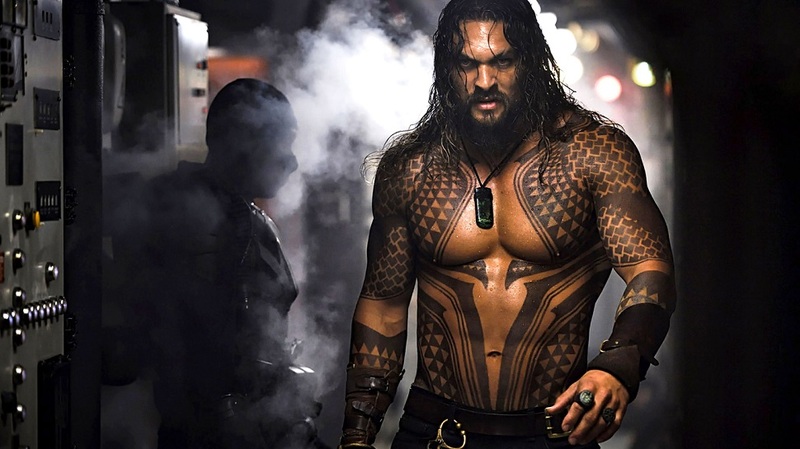 The character of Aquaman has gotten a bad rep in the past, so if there's anyone burly and brawny enough to give Arthur Curry a solid characterization, Jason Momoa is definitely not a bad choice. We didn't hate what they did with him in "Justice League," but with Batman, Wonder Woman, Superman, and the overly charismatic Flash in the fray, Cyborg and Aquaman kind of got lost in the shuffle a bit. Now with his own feature film, Curry gets the chance to dazzle audiences everywhere...and dazzle he does, dazzling like the way we look at a magnificent platter of nachos that have been slathered with cheese. We mean it, "Aquaman" is intensely cheesy, but somehow, it still manages to maintain a bit of fun in between the jokes, Dolph Lundgren's flowing red hair, Willem Dafoe's man-bun, Patrick Wilson's incessant screaming, and Pitbull and Rhea's cringe-worthy cover of Toto's "Africa." There is so much in this movie that is utterly ridiculous, but James Wan and co. were obviously never going to be able to find a way to make terms like "Ocean Master" sound serious, so they leaned into the hilarity of it, and we think their gamble paid off for the most part. Much of the dialogue is horrible and is often delivered with all the flavor and stiffness of a plain rice cake. Amber Heard is the worst offender when it comes to wooden performances as she delivers her lines like she is reading them directly off cue cards. While Jason Momoa can be stiff in his delivery, it's hard to say anything bad about the dude because his lighthearted attitude is sort of infectious. That being said, you also have king Willem Dafoe and queen Nicole Kidman in this picture, and they look like they are having a blast in their roles. They are so good that even the silly dialogue they have to deliver sounds earnest and grand coming from them. The story itself is a familiar one. In fact, it is amazingly similar to "Black Panther" from earlier in 2018 where a native of a hidden culture who was raised in the outside world must return to challenge the king for his throne with an impending war hanging in the balance, only this time, it is the outsider who is the hero instead of the villain. Look, we're not going to rag on it for being similar to other comic book movies, there are only so many stories to be told both Hollywood and in the superhero realm. With "Aquaman," James Wan embraced the absurd nature of the source material and has managed to make an entertaining movie that is visually awesome at times. We were a little worried about the visuals when we first saw the trailer for this film. The final rendering winds up being pretty dang stunning most of the time as iridescent and luminescent rideable seahorses, underwater tribes, and the city of Atlantis itself come to life right before our eyes, though we will admit there some noticeable chunks of oversaturated messiness. In the end, "Aquaman" may not be a brilliant piece of cinema, but it will make you smile and make you laugh (we sure as hell know it made us chuckle, probably a little too much). We remained mostly engaged in the movie no matter how silly and eye-rolling the story and its dialogue may be. Jason Momoa's compelling energy will keep us looking forward to the next installment in the DCEU franchise one more time.